The Lynk&Co 01 has made its public debut at the Shanghai motor show, as the company launches into China. The 01 is the first model to come from Lynk&Co, the all-new Chinese-owned and Volvo-backed car brand from Geely. It's a mid-sized tech-laden SUV that's claimed to be “the most connected car to date” and is now ready for market. Its maker says the 01 will be the first Chinese-made car to be sold in volume in Europe, once the company spreads here. The model has been designed and engineered in Sweden. It has an electrified powertrain and be built on modular architecture shared with Volvo’s forthcoming XC40. The 01 is claimed to have a premium specification and to “address the needs and preferences of the new global and connected generation”. Lynk&Co's 01s will always be connected to the internet and to their own cloud. A standard 'share' button will let owners control, monitor and share their cars via a smartphone or from the car. The new marque’s design philosophy has been developed at Geely Design in Sweden, led by group executive vice president and former Volvo design boss Peter Horbury. Designers say their aim was to create a strong personality that captures both European and Chinese genes. “The design brief was simple,” said Andreas Nilsson, head of design. “Our car needed to stand out from the crowd and appeal to a global audience..."
Little mechanical detail has been revealed, but the 01 is likely to have a range of transverse, front-mounted engines from Volvo’s family of 2.0-litre four-cylinder and 1.5-litre triples. Member of the board of directors for Geely and Volvo Carl-Peter Forster confirmed to Autocar that a plug-in hybrid version will follow soon after, with electric drive for both axles. This suggests the drive systems will be derived from Volvo hybrid models, of which the XC40 sends electric drive to the front wheels and the larger XC90 to the rear wheels. Transmissions are either six-speed manuals or seven-speed dual-clutch automatics. The car measures 4.6m long. Lynk&Co said its wheelbase is comparably long, given the SUV's overall length, because the Chinese market really cares about rear cabin space and less about boot capacity. As with all Lynk&Co models that will follow – and 02 and 03 models are already being mentioned – the 01’s creators say they aim to challenge current preferences within the motor industry. The Lynk&Co range will be closely related to Volvo's in order to improve Volvo's economies of scale. Geely and Volvo believe the platform underpinning it will have the versatility of Volkswagen's MQB architecture but be more affordable. 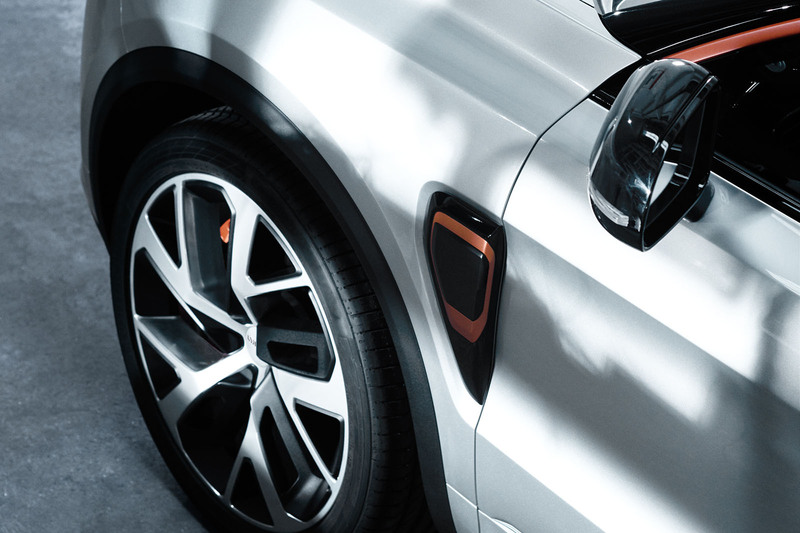 Rather than offering traditional trim levels, Lynk&Co will have fixed-price equipment collections that draw inspiration from contemporary fashion and technology sectors. The new 01 SUV will have an open API (application programming interface), which will essentially allow outside developers to “enrich the automotive experience” of the 01 with new ideas of their own. An important part of the Lynk&Co challenge, said Visser, is to offer customers a new route to market that features direct contact with the manufacturer, along with personalised services and hassle-free-ownership. “Our aim is to enrich and simplify ownership by redefining how cars are bought, owned, connected, serviced and used,” he said. Lynk&Co believes the subsequent arrival of the 02 and 03 will build towards “a full range” whose straightforward model names reflect the brand’s idea of simplifying and challenging industry conventions. The new models won’t neglect dynamic qualities, according to R&D boss Mats Fagerhag, who runs a shared Geely-Volvo R&D centre called CEVT (China Euro Vehicle Technology). The 01 has been benchmarked against good SUV competitors. “We have developed state-of-the-art cars that are strong, lightweight, efficient, fun to drive,” Fagerhag said. The Lynk&Co 01 has attracted 6000 orders in 137 seconds - a new world record for the fastest-selling car in the world, according to the brand. A three-day period was set out in the brand’s pre-sales event, with an allocation of 6000 units for sale to early customers in China ahead of the car’s official sales launch. The car made its public debut at the Shanghai motor show, as the company launches into China, with the small SUV priced from around £17,947, rising to £22,920 for top-spec models. The 01 is the first model to come from Lynk&Co, the all-new Chinese-owned and Volvo-backed car brand from Geely. It's a mid-sized tech-laden SUV that's claimed to be “the most connected car to date”. It has big boots to fill and talented rivals to face. Is it up to the task? The 01 is claimed to have a premium specification and to “address the needs and preferences of the new global and connected generation”. Lynk&Co's 01s will always be connected to the internet and to their own cloud. A standard 'share' button will let owners control, monitor and share their cars via a smartphone or from the car. The new marque’s design philosophy has been developed at Geely Design in Sweden, led by group executive vice president and former Volvo design boss Peter Horbury. Designers say their aim was to create a strong personality that captures both European and Chinese genes. The 01 is likely to have a range of transverse, front-mounted engines from Volvo’s family of 2.0-litre four-cylinder and 1.5-litre triples. Member of the board of directors for Geely and Volvo Carl-Peter Forster confirmed to Autocar that a plug-in hybrid version will follow soon after, with electric drive for both axles. The new models won’t neglect dynamic qualities, according to R&D boss Mats Fagerhag, who runs a shared Geely-Volvo R&D centre called CEVT (China Euro Vehicle Technology). The 01 has been benchmarked against good SUV competitors. “We have developed state-of-the-art cars that are strong, lightweight, efficient, fun to drive,” Fagerhag said. Is that really the best they could come up with for a down road graphic? I think those are just the indicators, the real lights are below within the grille. Much like a Picasso, Cherokee or many other contemporary cars with a high bonnet, really; it's a fashion. .....remember Qoros was going to set the world alight with Premium Chinese cars designed by Europeans and with heavyweight European board members incl one from BMW. Now no one even remembers the name 2 years later. Truth is there is already over capacity in the Industry and no one really needs yet another faceless, unknown/synthetic brand....we have Tesla already for that. Clearly they are trying to differentiate themselves from the Chines mob by being 'techy' and 'connected'. Not something which is high on the list of needs until we have autonomous cars other than for Facebook etc. addicts. Nice to see a Chinese car company that's has character and innovation, and not simply copying other car makers, though I immediately see a lot of Volvo DNA here and the design team is from Sweden which is not a bad thing. The name is rather awkward like other Chinese carmakers. It sounds a lot like Lincoln Co. -- not a greatest car company name to be confused with. I do agree with JJ's comments on the unusual headlights. I think it looks a bit like a Porsche Cayenne with one too many facelifts. The lights perched on the bonnet remind me of the juke, I quite like it, interesting to see how it all pans out. Straight in with the dumbest car name in history. Suddenly Cee'd sounds kind of classy. [quote=androo]Straight in with the dumbest car name in history. Suddenly Cee'd sounds kind of classy. [/quote] Agreed! I think for a long time Chinese cars have been the laughing stock of the industry. The general public has been divided between "no-one will ever want to buy a chinese car" and "they will become a force to be reckoned with, it's just a matter of time", like Skoda and the Koreans until a few years ago and the Japanese long before them, or the Huawei and LG of the mobile phone world. I am in the latter field. Haven't seen a Qoros anywhere but this looks serious. Perhaps not a real class leader contender but definitely no more than a couple of generations away.